The manufacturer admits that its LLF is a customized device that is very fast because it is tailored for performance. The memory will cost 10 times less than DRAM, but 20 times more than 3D NAND (at least based on today’s estimates) in terms of per-GB prices, so it will likely be used only by select applications aimed at datacenters or high-end workstations, similar to where Optane and Z-NAND is today. 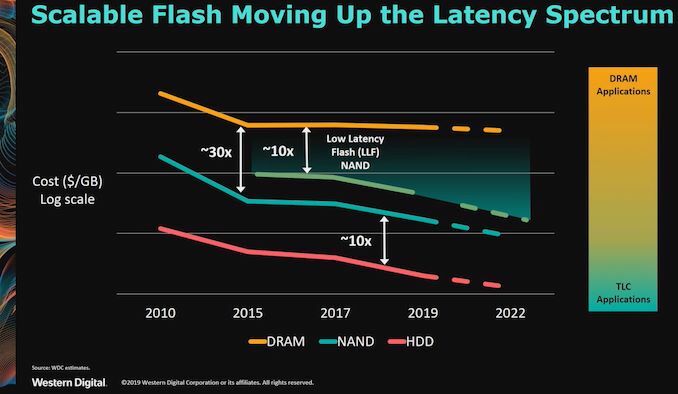 Western Digital does not disclose all the details regarding its low-latency flash memory and it is impossible to say whether it has anything to do with Toshiba’s XL-Flash low-latency 3D NAND introduced last year as well as other specialized types of flash. Quite naturally, the company is also reluctant to talk about actual products based on its LLF memory, or when are they set to become available. 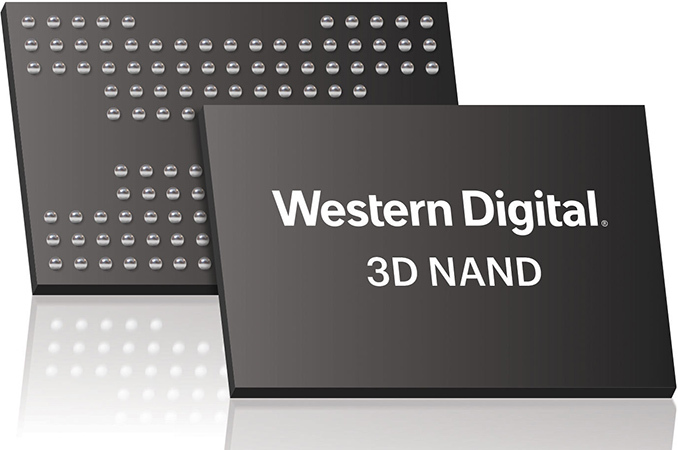 Meanwhile, Western Digital’s LLF belongs to the BICS4 generation of 3D NAND memory and can therefore be produced even today. While Western Digital’s low-latency flash will compete against Intel’s Optane and Samsung’s Z-NAND SSDs, the company does not call LLF as a Storage Class Memory (SCM). 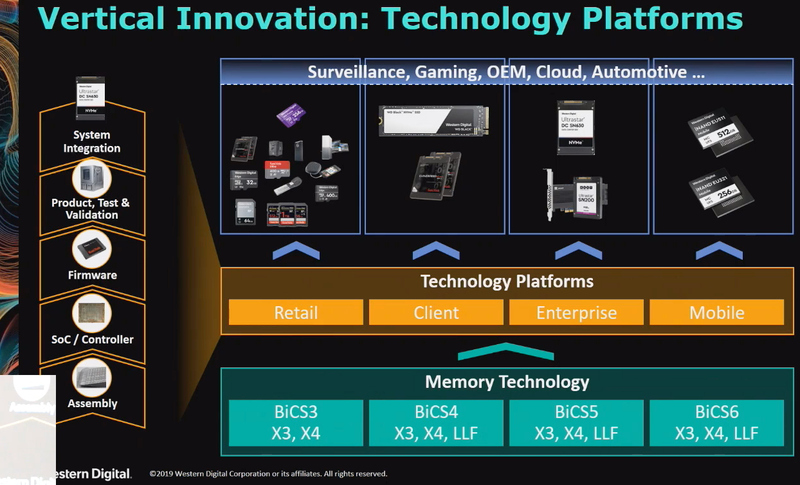 In the more long term, Western Digital is working on ReRAM-based SCM internally, and on memristor-based SCM with HP. Keeping in mind that research and development cycles take many years, it looks like the company will address applications that require capacity and performance with a more familiar NAND flash before adopting next-gen technologies. 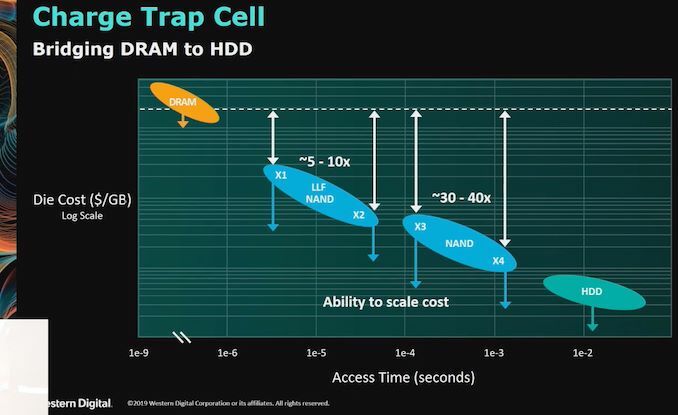 "The memory will cost 10 times less than DRAM, but 20 times more than 3D NAND"
"...using 1 bit-per-cell and 2 bit-per-cell architectures." " There's no such thing as "static DRAM" :) "
There is no escaping the similarities in architecture between X-Point and RAM, not withstanding the fundamental difference in architecture allowing X-Point to hold a cell state without power not unlike NAND.